We thought cotton was soft but the combination of sustainable bamboo and cotton is out of this world. It is SUPER soft. Pile height is 30mm / 1.18in. Absorbs better and dries more quickly. Machine wash and dry. See care details below. 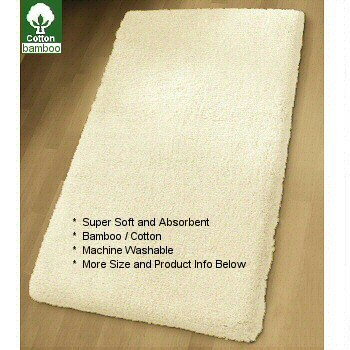 Our bamboo bath rugs are made from sustainably grown bamboo and cotton. Bamboo has natural antibacterial properties. Incorporating soft natural cotton fibers produces a luxurious bath rug. Natural: Stunning light cream color. Savannah Beige: Soft medium tone brown. Bamboo / cotton blend woven into a soft dense pile.